So you decided to purchase a TREKSTOR M.2 SSD Module or have already purchased one? For that, we would like to gratulate you upfront. Due to the module you will be able to upgrade your devices' storage with a few simple steps, ultimately extending ist capabilities to suit your personal needs. In case you never mounted a SSD drive and therefore have open questions, please refer to our two video guides. They should be able to answer all of them. In general, TREKSTOR M.2 SSD Modules are compatible with all M.2 connectors based on the so called B or M Key. Naturally, we content on this website focussed on the installation process for TREKSTOR devices with SSD extension slots. For thar we ask for your understanding. TREKSTOR is the first manufacturer to offer a wide variety of devices with SSD extention slot. Please refer to the following list to gain an overview. As mentioned before, TREKSTOR M.2 SSD Modules can also be installed in devices from other manufacturers. Please check if a certain device fullfils the requirement by reading the manual. Every TREKSTOR M.2 SSD Module comes with a illustrated installation guide, that can also be downloaded at the bottom of this page. Apart from that, we recommend watching the following video, which showcases the whole installation process. Some devices from TREKSTOR come with a version of Acronis True Image 2018, a software that allows you to copy your operating system from the fast eMMC storage to the even faster M.2 SSD Module. This process is called cloning because no data is lost and your system - once the process is done - looks exactly like before. Again we recommend watching the video below, as it depicts all the right steps necessary to successfully clone your system. In case you installed your TREKSTOR M.2 SSD Module into a system without Acronis True Image 2018, we offer a trial version for download at the bottom of the page. How to I build in my SSD module in the extension slot? My SSD drive isn't recognized by the system. In individual cases the SSD module might need to be initiated manually. To do so, please right click the Windows icon in the bottom left corner of your screen and select the "Disk management" option. In there you will find a volume called "Disk 0" with the note "Unallocated". Right-click it and select "New Simple Volume" following all the steps prompted. Once done, the SSD module will be available as drive D:. What is the maximum storage capacity supported? TREKSTOR offers modules up to 512 GB of capacity. In general, the M.2 interface build-in allows for higher capacities up to 1 TB. If you decide to use an untested off-brand SSD module, please be aware that TREKSTOR cannot warrant any problems. What happens to my warrenty when I build in a SSD module? No, the existing warranty isn't touched by adding a SSD module. 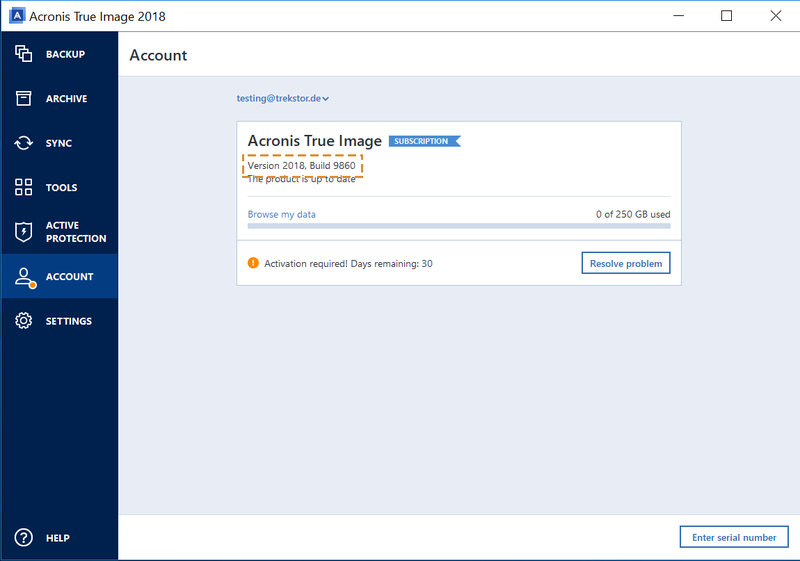 How do I activate my Acronis True Image license?